Transforming any place in movie theater. 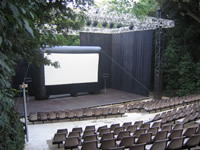 From the small square of school to the public place , The congress palace to the football stadium, any public space or private space, indoor or outdoor, can be transformed in a Movie theater. the technics conditions as much as your budget! These variables will never change.. The respect of public as of a cinematographic work.